When Pete Gogolak came to America from Hungary in the 1950s, he was crushed to discover that nobody played soccer at his high school in upstate New York. Instead, the kids played a purely American game he had never seen. When he gave it a shot, he felt strange in shoulder pads and a helmet. The first few times he kicked the odd-shaped ball, he could barely get it airborne. "I didn't know what the hell was going on," he says with a laugh. As Gogolak, 74, recalls his 11-year career as a professional place-kicker, other moments tumble from his memory. There was the time he hit the top of a Coke bottle protruding from the dirt while attempting a field goal at Buffalo's War Memorial Stadium. There was the 57-yard kick he made in his first pro game, an exhibition against the? New York Jets?in 1964 at a nearly empty stadium in Tampa, Florida. There was the first time he and his younger brother kicked against each other in a pro game in 1966 -- just a couple of eastern European immigrants representing the New York Giants (Pete) and Washington Redskins (Charlie) in front of the parents who brought them to the land of opportunity. "That was wonderful," Pete says. Also vivid is the tryout he had with a Buffalo Bills scout in the spring of 1964 at Cornell, where he kicked a 50-yard field goal as a senior. Gogolak put on a show, drilling one kick after another through the uprights from various distances. The scout was both impressed and surprised. "He said, 'Geez, I've never seen anybody kick this way,'" Gogolak says. "This way" was soccer style. Gogolak approached the ball from an angle, off to the side, planted his left leg and then rotated his whole body to swing his kicking leg through the ball. At the time, it was revolutionary. The Bills selected Gogolak in the 12th round of the 1964 AFL draft. After two seasons in Buffalo, he jumped to the NFL's Giants in 1966, the same year Charlie was a first-round pick of the Redskins. Sept. 11 marked the 50th anniversary of Pete's 26-yarder against the Pittsburgh Steelers, the first soccer-style field goal in NFL history. 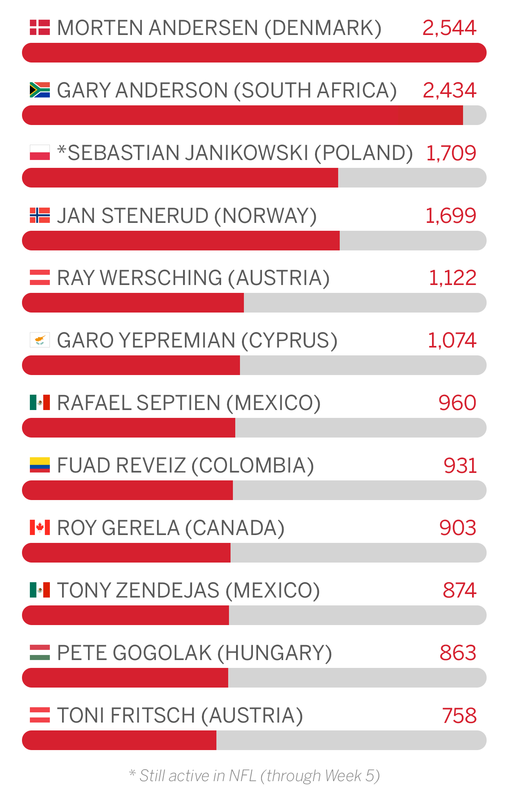 Other soccer-style kickers -- mostly Europeans -- soon followed. Garo Yepremian (Cyprus) started kicking for the Detroit Lions midway through the '66 season. Then came Jan Stenerud (Norway) to the Kansas City Chiefs in 1967, Bobby Howfield (England) to the Denver Broncos in '68, Horst Muhlmann (Germany) to the Cincinnati Bengals in '69 and Toni Fritsch (Austria) to the Dallas Cowboys in '71. Suddenly, the purely American sport was attracting impact players from around the globe. By 1977, half of all NFL teams featured soccer-style kickers from other nations. By 1987, every team had a soccer-style kicker, but most were homegrown. The era of the straight-on kicker with the square-toed shoe was over. Gogolak's impact was immediate, though he didn't realize it. His 57-yard field goal for the Bills in his exhibition debut against the Jets exceeded the standing NFL record of 56 yards. Jets coach Weeb Ewbank saw Gogolak as a game-changer. "After I saw him kick that one, I thought, 'I'll either try to get them outlawed, or I'll get one myself,'" Ewbank says. Jim Bakken was a terrific straight-on kicker for the St. Louis Cardinals from 1962 through 1978. He led the NFL twice in field goals and field goal percentage and was a four-time Pro Bowler. He ranks among the top 30 on the league's all-time scoring list with 1,380 points in a career that spanned the pre- and post-Gogolak eras. It didn't take him long to see that the newfangled kickers had an edge. "The more you saw of the soccer style, you began to realize the advantage they had," he says. "The advantage was the twisting of the body, much like a golf swing, where you're using more than just your leg to snap through [the ball]." Bakken, 75, explains further with a non-football question: If you wanted to kick somebody in the rear end, "Would you come straight at him, like the place-kickers when we played, or would you kind of come at him from the side and whip your leg into him?" He laughs, then answers his own question: Most people would come from the side. "That's kind of a natural move," he says. 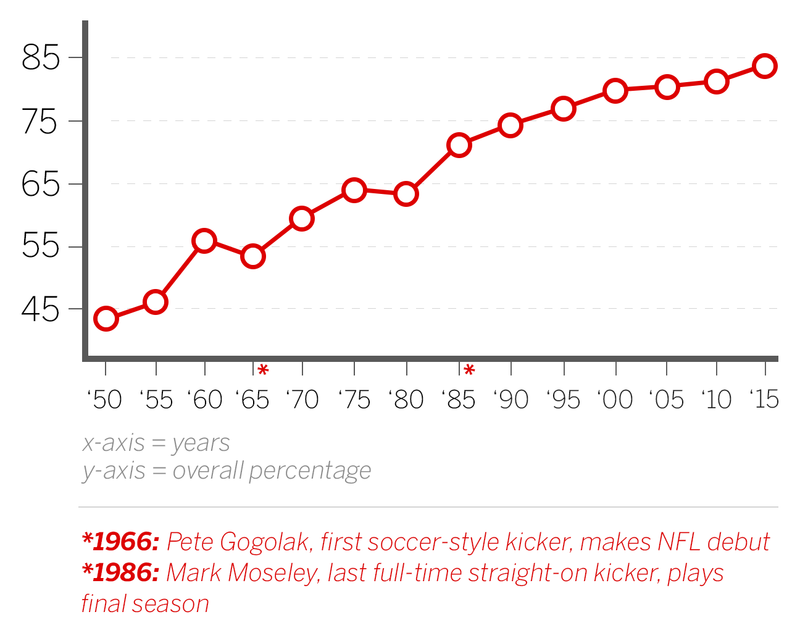 Kicking stats improved quickly in the soccer-style era. In 1965, NFL kickers had a field goal success rate of 53.8 percent. That year, only one kicker, the Minnesota Vikings' Fred Cox, made a field goal of 50 or more yards. Overall field goal percentage climbed to 59.4 percent in 1970, 64.2 in '75 and 72.2 in '85. The success rate on kicks of 50 or more yards improved from 13.1 percent in the 1960s to 21.6 in the '70s, 35.6 percent in the '80s and 47.8 percent in the '90s. In 2015, NFL kickers made 84.5 percent of their field goal tries and 65 percent of attempts from 50 or more yards. The sidewinding style has been at the heart of the improvement. "You have a larger surface when you hit the ball," Gogolak says, referring to the inside of the foot. Gil Brandt, who was the vice president of player personnel for the Cowboys for three decades starting in 1960, says the margin of error for straight-on kickers was smaller. "You have to hop through the ball, and your foot has to come down straight, exactly straight ahead," he says. When he scouted straight-on kickers in the 1960s and '70s, Brandt set up directly behind them to see if they could consistently repeat that straight-line swing path. Any deviation meant a hook or slice. Also, Brandt says, the sweet spot of the square toe for straight-on kickers is smaller than the instep of the shoe. After the initial success of the sidewinders, Brandt says NFL teams had "no choice" but to seek them out. Stenerud, especially, was the early gold standard. In 1968, Chiefs head coach Hank Stram explained how Stenerud, the first (and so far only) pure kicker in the Pro Football Hall of Fame, added "an exciting new dimension" to his offense: "Anytime we get to midfield, we're a threat to score three points. ... There isn't a doubt in my mind that he's the greatest long-distance field goal kicker who ever played the game." In 1971, Brandt and several other Cowboys reps went on what he calls "a European kicking tour" through cities such as Oslo, Copenhagen, Vienna and Frankfurt in search of the next Gogolak or Stenerud. In Austria, they found Fritsch, a national soccer hero who had won fame in 1965 by scoring two goals in a victory over England. They also signed a Swedish player. Both came to the U.S., but only Fritsch stuck. The Swede returned home to become a baker. Brandt says Fritsch knew nothing about football, but that was OK. In one early game against the Cardinals, Fritsch went in for a late, potentially game-winning field goal. Brandt recalls St. Louis' Larry Stallings trying to psych out the kicker. "He starts yelling, 'Hey Fritsch! Choke, choke, choke, Fritsch!'" Brandt says. "[Dallas'] Dave Edwards says, 'Hey, he can't understand English!' Fritsch just stepped up and made the field goal." Of course, not all the gains in kicking are due to the soccer-style technique. Playing surfaces have improved, and some teams play in weather-perfect domes. Weight training and film study can help today's kickers -- mostly American-grown athletes with soccer backgrounds -- be stronger and stay consistent. Stenerud, who says today's kickers are better than ever, also believes today's balls travel 8-10 yards farther because kickers can work with them before games. Brandt says the impact of snappers and holders who consistently give kickers the ball in perfect position can't be understated. Specialization helps too. Kickers in the pre-soccer-style era often played other positions. Lou "The Toe" Groza was a starting offensive tackle. Paul Hornung was a running back. George Blanda played quarterback. They couldn't devote all their attention to kicking. "Hornung used to come out on third down to change his shoe if it was going to be a field goal situation," Brandt says. Stenerud says Blanda once told him: "Hell, if I was sacked on third down and got the wind knocked out of me, I had to get back up and kick a field goal." While Gogolak was kicking for the Bills in 1964, Stenerud was at Montana State on a skiing scholarship. That year, Stenerud was running at Montana State's stadium when he saw one of the football players practicing his place-kicking. Stenerud, who played soccer, asked to give it a try. At first, he kicked straight on, imitating the style he saw. Even in tennis shoes, Stenerud outkicked the football player. "After a few times, I said, 'Is it legal to kick with the side of your foot, like a soccer corner kick?'" Stenerud, 73, says. "I doubt he knew what a corner kick was, but he said, 'Yes, you can. Because there's this guy for the Buffalo Bills, his name is Gogolak, and he kicks with the side of his foot.' So I kicked a few that way." A few weeks later, head football coach Jim Sweeney saw Stenerud running at the stadium. "I hear this booming voice, 'Hey, skier, get down here! I hear you can kick!'" Stenerud says. Then Stenerud got a tryout in front of the whole team. Sweeney set the ball up at the 40, as if for a kickoff, and invited Stenerud to kick. He topped the first one, which elicited laughter. Then he started pounding balls through the goalposts into the seats. The next year, he was invited to come out for the team, and he kicked a 60-yard field goal in a spring game. Later, he kicked a record 59-yard field goal against rival Montana. Stenerud made a 54-yard kick in his first game with the Chiefs in 1967 and went on to lead the AFL in field goals attempted and made as a rookie. He made six field goals of 50-plus yards in his first three seasons and consistently drilled kickoffs over the end zone and into a wall 74 yards away. "George Toma would mark X's on the wall that my kickoffs hit," Stenerud says of the groundskeeper at Municipal Stadium, where the Chiefs played until 1972. "I would have a lot of X's on that wall." Stenerud believes his performance in the Super Bowl IV victory over the Vikings in January 1970 helped inspire American kids to become soccer-style kickers. He went 3-for-3 on field goals in that game, including a Super Bowl-record 48-yarder. "I'm sure parents would think, 'Well, little Johnny may not be a running back or a quarterback, but he can kick,'" he says. In December 1986, Mark Moseley, the NFL's last full-time straight-on kicker, made his final field goal as a member of the Cleveland Browns. Nine months later, in the 1987 season opener, Redskins punter Steve Cox stepped in for injured place-kicker Jess Atkinson and connected on a 40-yarder -- the last straight-on field goal in NFL history. To this day, Gogolak is surprised that he was the first soccer-style kicker to stick and flourish in the pros. There had been others before him in college, but their time was brief. Texas' Fred Bednarski of Poland booted a 38-yard soccer-style field goal in 1957. American Evan Paoletti, a former soccer player, kicked extra points from the side for Huron College in South Dakota in 1958. Walt Doleschal of Czechoslovakia kicked extra points and field goals at Lafayette from 1959-61. "I think the guys that were soccer players here never felt comfortable to put a helmet on [to try football]," Gogolak says. "I think the kids probably made fun of them." Once those kids saw the style on TV, however, the door was open. Gogolak takes pride in being a pioneer. "I always say I should have patented this kick," he says. "You would be calling me in the Bahamas someplace, with my own airplane parked next to my house."